As part of our work in the University of Washington’s Information and Communications Technology for Development (ICTD) Lab, we recently spent four weeks in Bokondini, a village in the Papuan Highlands. During our time in Bokondini, we helped some community members extend Internet access throughout the village via a community LTE network, using a technology stack that we call CoLTE (for Community LTE). Bokondini is a small village (population ~1,500) in the Baliem Valley, a mountainous region located in the highlands of Indonesian Papua. The Papuan Highlands are a famously rugged, remote, and hard-to-cover area, and many inhabitants of the region live without any form of telecommunications whatsoever. Infrastructure in Bokondini is a remarkably ad-hoc process; for example, electricity comes from a small set of solar panels and a micro hydro generator, and tends to shut off between the hours of 9pm and 6am. Bokondini’s current relationship to the Internet revolves primarily around the local school. The community pays for a small (1Mbps) satellite Internet connection that terminates at the local elementary school, where it’s used to provide WiFi coverage to teachers on the school campus. Coverage is extended to a few other houses in the community via directional antennas and WiFi hotspots, but the vast majority of community members do not have Internet access. 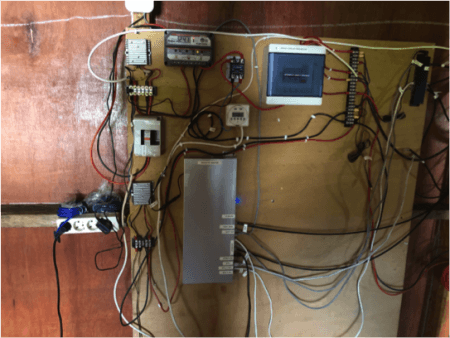 The Internet connection is managed and supported by Airwave Missions, a Wireless ISP (WISP) based in Wamena (Wamena is the main town in the Baliem Valley, and is approximately 3 hours away from Bokondini by truck) and run by David Haag. 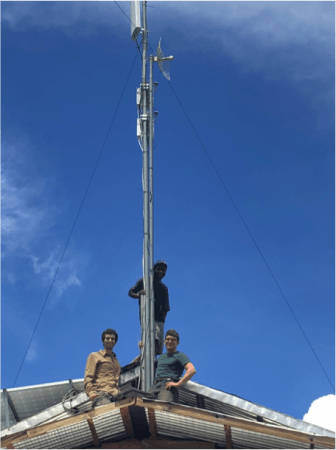 Airwave Missions is a textbook example of rural know-how and problem-solving, combining skilled technical knowledge and local community relationships to provide Internet coverage to many of the small, hard-to-reach villages throughout the valley. Every site that Airwave Missions serves is unique, and tends to require a custom, and often creative, solution, typically involving many different technologies and solutions. These technologies include the standard WISP set of satellite links, directional wireless links, and different forms of power (both on- and off-grid), but have gotten as creative as a custom-built lightweight, solar-powered wireless repeater that they installed on a mountaintop using a helicopter! Airwave Missions’ fieldwork operations are supported by a classic jack-of-all-trades technical support person named Ibel. Ibel has a deep understanding of all forms of rural infrastructure, and is equally comfortable fixing a DC hydroelectric generator with a multimeter as he is climbing a tree to anchor a guyline, lowering and hoisting an antenna tower, or wrenching on a two-stroke motorcycle. Ibel was our go-to support throughout the entire CoLTE installation – not just figuring out a wide range of issues, but really supporting and grounding the project within the community itself. Our team’s relationship to Bokondini started approximately five years ago, when Professor Kurtis Heimerl (then a graduate student at UC Berkeley) was contacted by a community member, and traveled there to help build a 2G community cellular network. The network was a great success, and was operational for over five years, until it was shut down in Spring 2018 as a result of a national telecom company expanding 2G voice and SMS coverage to Bokondini. The success of our previous 2G pilot, in combination with the lack of broad Internet access, led us to believe that a small-scale LTE network could be a viable solution to cover the entire community all at once, rather than continue to connect individual houses via directional antennas and WiFi hotspots. Our team spent September 2018 to June 2019 juggling a wide range of tasks: figuring out LTE, exploring our different open-source options, building CoLTE, ordering equipment (base stations, test handsets, and antennas), printing SIM cards, and coordinating with Airwave Missions on a wide range of logistics, from frequencies and geographic coverage to more mundane challenges such as lodging. In July, we packed all the equipment into three large containers and flew it all out to Wamena, where we met up with Ibel and trucked everything out to Bokondini. Once in Bokondini, the entire installation process spanned a couple of weeks, during which the work took on a wide range of forms. We encountered unexpected equipment failures, replaced one of our US-made switches that only ran on 110VAC (Indonesian grid power is 220VAC), spent some time furiously debugging OpenAirInterface, and had to get a bit creative with the antenna mounting process – but the speed bumps were minor and manageable, and all-in-all the deployment went about as smoothly as could be expected. Once the network was up and working reliably, we all spent a couple of days walking around Bokondini, collecting metrics on signal-strength, range, and network performance – quite literally, the old “can you hear me now?” commercial. The results were, in a single word, great. The network covers over a mile, and easily serves the entire community. WhatsApp messages work just fine, and WhatsApp voice calls come through at high quality, even if there’s a bit of delay (fully understandable – the signal gets bounced to space and back two separate times!). All websites seemed to work without any problem, even if they loaded slowly. The one outlier we found was that YouTube traffic loaded surprisingly quickly. With the network built and tested, all that remains is to begin the public network launch. Airwave Missions is currently finalizing costs, distributing SIM cards, and creating a gradual deployment plan. We hope to bring the network live for the first batch of test users at the end of September, and then gradually roll out additional coverage. While Airwaves Missions is rolling out coverage, the UW team returned to Seattle, and has been hard at work on several CoLTE-related fronts. These tasks include simplifying the installation front, hardening the code and system, adding web-based configuration and status-monitoring tools, and producing a basic how-to guide for anyone seeking to deploy their own community LTE network. For more information on CoLTE, or to get involved with a deployment, please email colte@cs.washington.edu.